This was Day 7 and last chase day of Silver Lining Tours (http://www.silverliningtours.com/) Tour 8. 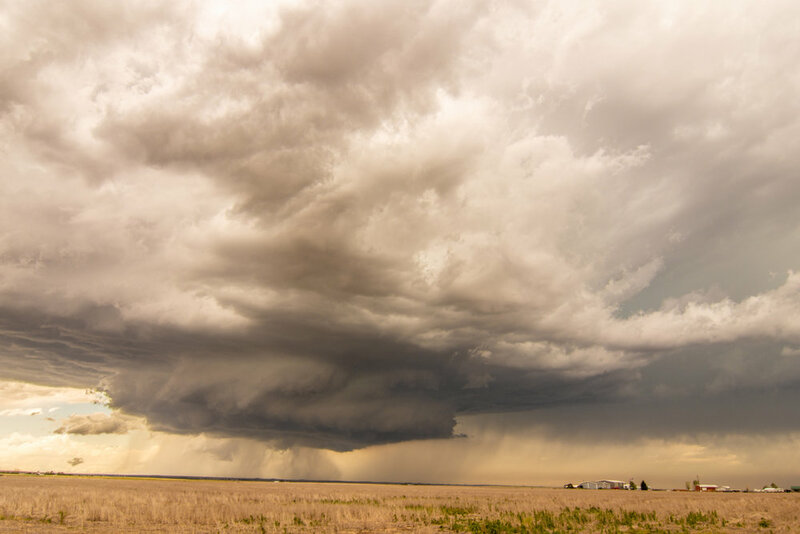 After chasing some decent storms in the Oklahoma Panhandle the day before, we made our way up to eastern Colorado towards the base city of Denver. There was not a lot of expectations this day due to a low-moderate instability and dewpoints only in the upper 50's to lower 60's, but deep layer shear was around 45 knots. But the models continued to break out storms east and southeast of the Palmer Divide and also off the Raton Mesa in northeast New Mexico. Since we had to be back in Denver that night, we proceeded to chase the northern target but, again, with limited expectations. To our surprise, a few storms developed along a remnant outflow boundary from the night before and this provided the lift and focus necessary for the storms to intensify and move southeast into better air. 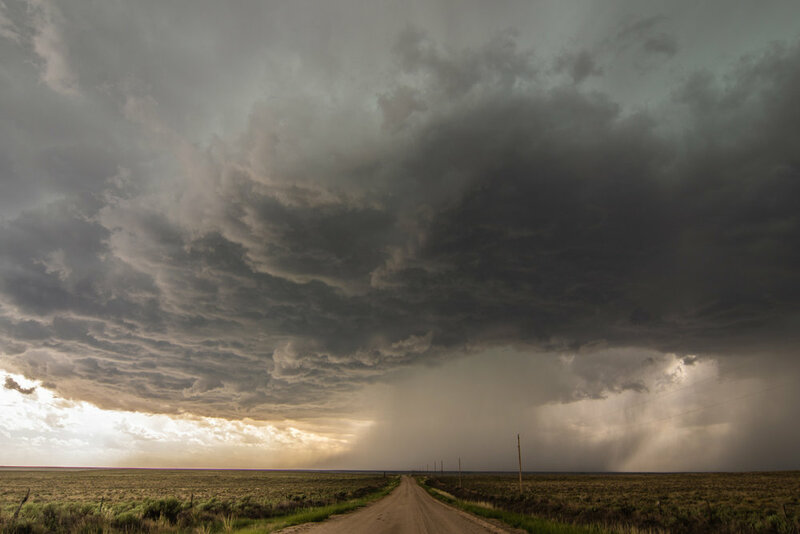 After stopping to take photos of a really cool abandoned farm house between Limon and Hugo, Colorado, we got on the first storm just south of Hugo and chased it south to east of Punkin Center. The storm actually had some pretty good structure for a while before congealing with other storms. Nice to have a better than expected chase day to wrap up the tour! Creepy abandoned farm house between Limon and Hugo, Colorado. The dead trees surrounding the house really give it a spooky look. Thought a guy with a chainsaw was going to come flying out of this place at any moment. The storm getting its act together south of Hugo, Colorado. Mammatus clouds on the developing supercell. Storm starting to take on some good structure and a solid base! Storm was high based so was not really expecting much tornado potential. 2 separate cores opening up in the distance. Some of the best structure of the day on this severe warned supercell. Intense rain foot and hail core down the road. Storm still exhibiting some good structure east of Punkin Center, Colorado. Almost looked like a high based wall cloud trying to form here. Another shot of the storm east of Punkin Center towards Aroya, Colorado. Final shot of the day of the storms well defined updraft base. Storm still had really good inflow but soon lost a lot of the good structure. Mesoscale discussion issued at 1:36 PM MDT. Storms expected to produce large hail and damaging winds on northern end of the instability axis. Around 45 knots of bulk shear into the area, but not a lot of CAPE. Severe thunderstorm watch issued for the area at 2:20 PM MDT. This mesoscale discussion was issued at 5:37 PM MDT, shortly after we stopped chasing and headed to Denver. Line of severe storms with damaging winds was expected to continue southeast into the evening. Chased a beast of a tornadic supercell out of eastern North Dakota into northwest Minnesota. Witnessed a multiple vortex tornado between Hatton and Buxton, North Dakota before it wrapped back into the core and was not in view. Thereafter, I stayed in or near the notch and thankfully had a good road network to do so as I stayed with the storm southeast into Minnesota, ending the chase near Ada. The storm exhibited terrific supercell structure throughout its entire life cycle! A textbook mothership. Tornado! Multiple vortex tornado between Hatton and Buxton, North Dakota. Had to be right in the notch to view this as the tornado formed on the north side of the core as the wall cloud was wrapping back in. This photo is out of sequence with the others below. Wanted to show this first. 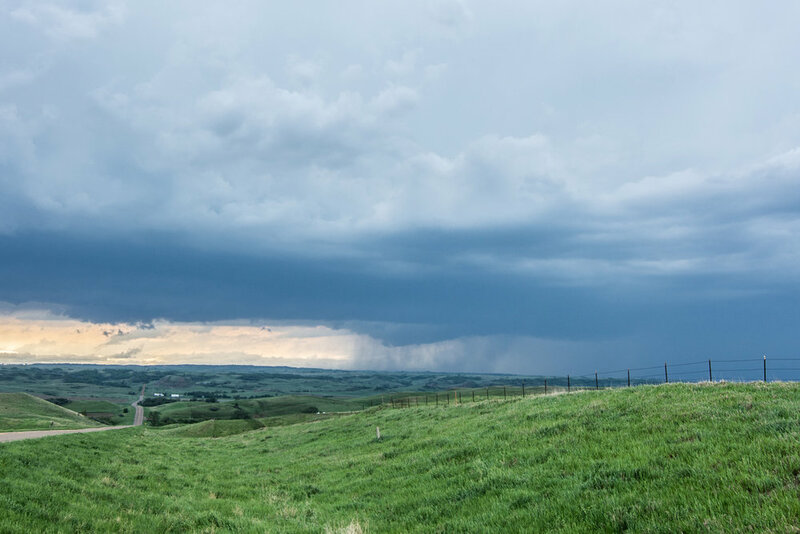 Storm starting to get organized with a lowering already forming near Northwood, North Dakota. 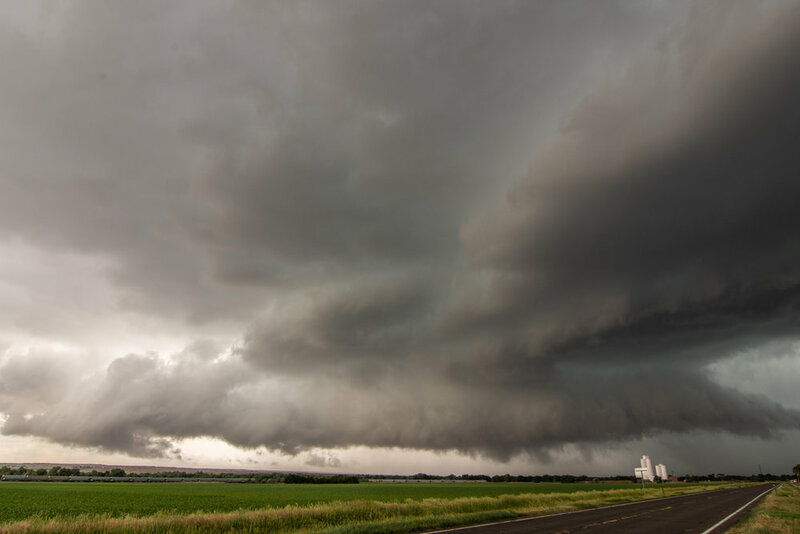 Supercell forming with wall cloud and inflow tail right to left into the base near Northwood, North Dakota. Wall cloud tightening up with structure taking mothership appearance north of Hatton, North Dakota. Beautiful supercell with tornado in progress on the right side of the core and terrific structure west of Buxton, North Dakota. Multiple vortex tornado tucked away in there! Roughly 1.5 miles west of my location between Hatton and Buxton, North Dakota. Intense core approaching me from this mothership supercell. Inflow tail present as moisture is being focused and drawn into the storm. Another shot of the intense supercell approaching me near Buxton, North Dakota. Tornado is occurring at this time but cannot see it due to being shielded by the rain and hail core. Textbook supercell here with big wall cloud on the right side of the core underneath the updraft vault. All you can say is WOW! Multiple inflow bands as rich moisture in the low and mid levels is being drawn into this storm near Shelly, Minnesota. Looks like the mothership is coming in for a landing! Awesome storm near Shelly, Minnesota as I got 5 miles out ahead to get a better shot of the structure. Intense mothership supercell after producing a tornado near Buxton, North Dakota. This was as the storm was nearing the river crossing into Minnesota near Shelly. A mean looking storm, still tornado warned near Ada, Minnesota. Storm starting to become more outflow dominant with wicked shelf cloud near Ada, Minnesota at the end of the chase. Chased this storm for 5 hours! Mesoscale Discussion issued at 3:48 PM showing favored areas for initiation of thunderstorms between 21-23Z (4-6 PM). Tornado watch issued at 4:40 PM for eastern North Dakota and northwest Minnesota. Valid until 11:00 PM. New mesoscale discussion issued at 7:09 PM showing the area of greatest tornado risk along the warm front and old stationary boundary near Grand Forks and areas south to Fargo, North Dakota, right where the supercell I was one was tracking and producing tornadoes. Severe thunderstorm watch issued at 10:00 PM for all of central Minnesota as the thunderstorms formed an intense cluster moving southeast and producing damaging winds. Mesoscale discussion issued at 1:49 AM as the thunderstorms continued to progress southeast and produce damaging winds, eventually reaching my house near the Twin Cities and moving east. Chased a supercell thunderstorm out of northeast Nebraska through Sioux City, Iowa where it produced baseball size hail, and into northwest portions of Iowa. This storm was tornado warned near Sioux City before becoming outflow dominant and producing a spectacular shelf cloud near Mapleton, Iowa. The storm had some really good structure for a while (see photos below). The video is primarily a time-lapse from two different segments of the storm. Terrific storm structure near Mapleton, Iowa at the end of the chase. This photo is out of sequence with the others below. Storm was tornado warned at this point, directly over Sioux City, Iowa. This area in the center of the image was the action area where there was notable rotation and a ragged, somewhat high-based wall cloud. Another shot of the wall cloud only a few miles south of Sioux City, Iowa. This was taken looking northeast. I quickly had to drive back into the core on the left side of this image to get across the Missouri River to get ahead of the storm into Iowa. I encountered quarter-size hail and thankfully missed the baseball hail that was reported in Sioux City. Wall cloud on the tornado warned storm near Owego, Iowa. This was as close as this storm came to producing from my vantage point. Storm now becoming outflow dominant and forming a shelf cloud near Smithland, Iowa. Lots of mid-level inflow bands still occurring into this storm here. 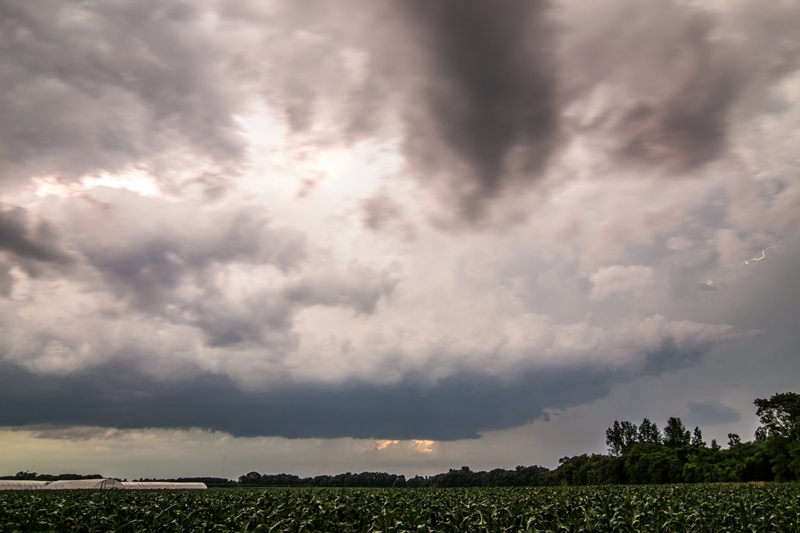 Another shot of the storm east of Smithland, Iowa as the shelf cloud became more prounounced. Short time later as the shelf cloud approached. Was interesting how a part of this shelf started to take on a different shape here. 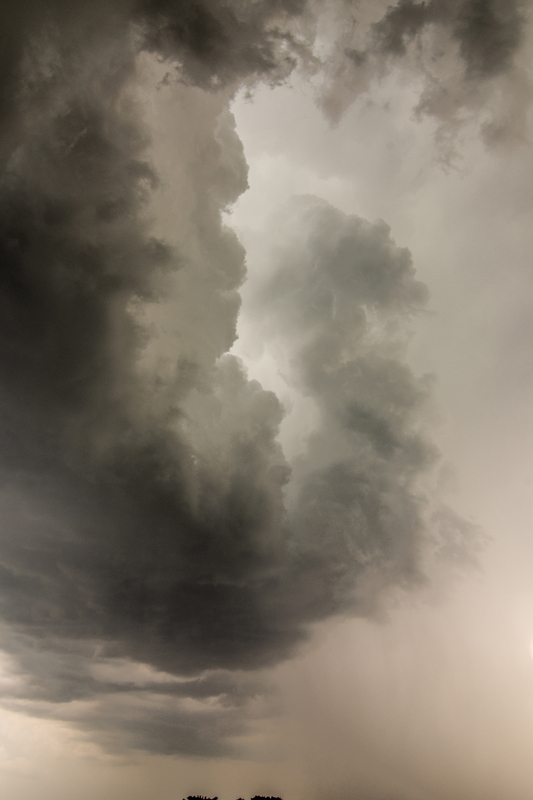 There was solid inflow occurring on the right side into this base...almost looked like a wall cloud attempting to form. Indicated storm may not be true outflow dominant here and was trying to focus an area of rotation with this lowering. Southern end of the shelf cloud, but still can see a few locations where inflow may be occurring in the notches. Shelf cloud approaching. Like that wavy appearance to the striations above the shelf. Mesoscale Discussion issued at 2:26 PM CT highlighting a likely severe thunderstorm watch upcoming. Storm I chased was on the warm front ahead of the triple point. Severe thunderstorm watch issued at 3:40 PM CT until 11:00 PM CT across eastern Nebraska and western Iowa. Took a trip down to Iowa with my wife, MaryLynn, to see the Bridges of Madison County, see other sites, and then chase some storms. There was not a lot of expectations on this day with limited deep layer shear and instability, but storms were likely to form on and ahead of the cold front in an environment that had been worked over some by rain and storms early in the day. 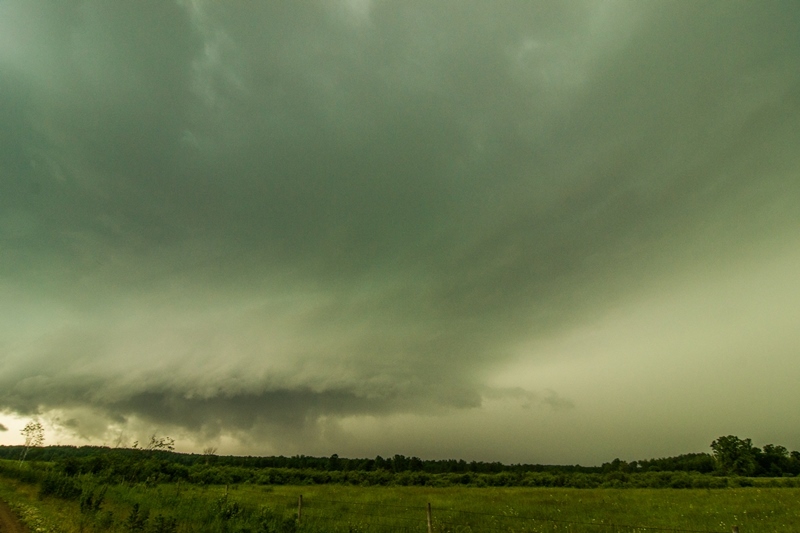 A storm that did form in northern Iowa somewhat surprisingly became a supercell and took on terrific structure during the early to middle part of its life cycle. This was the one good storm of the whole event and one of the few that became severe thunderstorm warned, as it formed and tracked along a remnant outflow boundary and cold front intersection. There was never a severe thunderstorm or tornado watch issued for the area as any severe storms were limited in coverage. My favorite shot of the day of the incredible storm structure and striations with fully established shelf cloud near Hansell, Iowa. Photo out of sequence from the others below. Multiple inflow tails to the base as we approached from the north near Meservey, Iowa. Got a little closer and I was surprised at the well developed wall cloud that had formed on the southeast side! Clearly can see the multiple inflow bands and I think the band of clouds right in front of us in this image is the actual outflow boundary the storm was rooted on. Extremely low cloud base on this storm. Looking west from near I-35 southeast of Meservey, Iowa. The storm lost the wall cloud here but was still showing signs of strong inflow and rotation in a few spots. Intense rain and hail core between Meservey and Chapin, Iowa. Storm is severe thunderstorm warned at this point. Awesome shelf cloud on the storm near Chapin, Iowa. Looking the other direction from the previous image, to the north as the core of the storm was approaching. Still some inflow into this storm as you can see from the bands on the left side. Shot of the storm between Chapin and Hansell, Iowa with grain bins in the foreground and shelf cloud about to overtake. Unreal structure near Hansell, Iowa! Looking northeast at the vault region of the storm and shelf cloud at the base. Storm looking mean as it gets near. Mesoscale Discussion issued by SPC at 9:09 PM CDT as isolated severe thunderstorms were ongoing along the front. They did not analyze the outflow boundary through north-central and northeast Iowa, but there appeared to be one there. Never did issue a severe thunderstorm watch since the storm coverage was low. Chased as a guide with Silver Lining Tours (http://www.silverliningtours.com/) on this trip. Got on a developing storm from the first updraft and followed it throughout its maturation cycle from near Hays, Kansas southeast to near Newton. 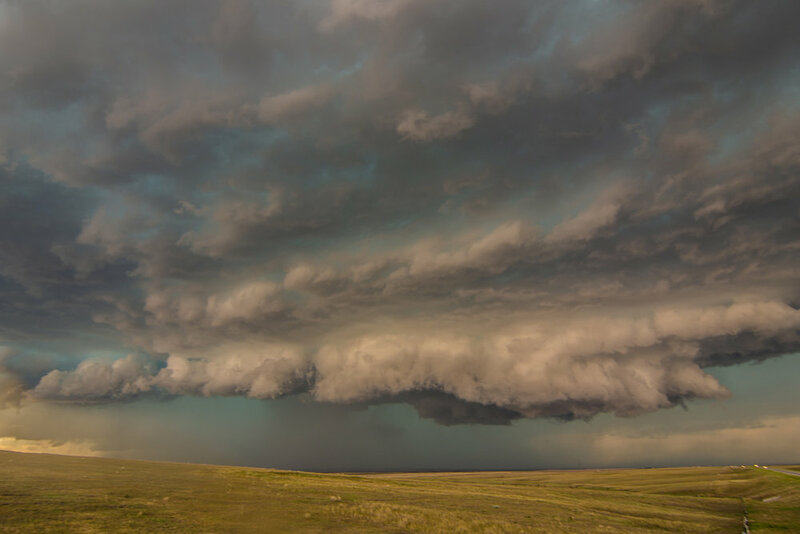 The storm was tornado warned much of the time and exhibited terrific structure initially, producing baseball size hail in Hays, and morphed into a dangerous squall line producing damaging winds near 70 mph later in its life cycle. The video shows a few time lapse segments from this storm, followed by our core punch through the squall line at the end of the chase. Focused gustnado on the leading edge of the outflow and shelf cloud. This was called in as a tornado by other chasers but appeared to be a gustnado over a tornado from our vantage point. Gustnadoes are much weaker and produced differently than tornadoes, but can still kick up a lot of dirt! This photo is out of sequence with the others below. Supercell in early stages south of Hays, Kansas. 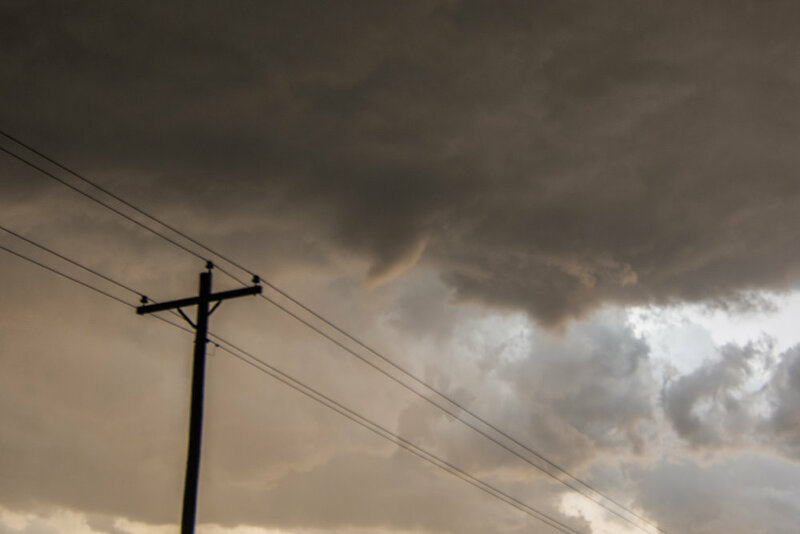 Lowering and brief funnel cloud in this image formed on the left side of the core. Zoomed out view of the previous image, showing the brief funnel left of the core and supercell taking on very good structure. Awesome structure with intense core/microburst occurring, and storm starting to go outflow dominant in central Kansas. Right side of the core as supercell is going outflow dominant. We are positioned southeast of the storm with storm motion being to the southeast towards us. Group of Silver Lining Tours guests enjoying the view of an intense supercell storm near Hoisington, Kansas. Still some inflow occurring on the northeast side of the intense rain & hail core over the open prairie of central Kansas. Just another shot of the previous gustnado image a few moments later. Gustnado washing out here but can still see the debris plume on the leading edge of the outflow winds on the left side where the gustnado was focused. Severe thunderstorm moving towards us. Stopped to get a shot of the storm as a backdrop to the limestone fence posts. As you can imagine, there were not a lot of trees on the prairies of Kansas so, when these fences were built, they used limestone rock for posts since this was more readily available. Cool to see these scattered about the countryside. Mammatus clouds ahead of the storm to the east of Great Bend, Kansas. Looking northwest at the approaching storm over a Kansas wheat field. Mesoscale Discussion issued by the Storm Prediction Center at 12:49 PM CDT, outlying the risk area for an upcoming Severe Thunderstorm Watch. Severe Thunderstorm Watch issued for central and eastern Kansas at 1:25 PM CDT. This is the area highlighted for expected wind gusts of 60-80 mph. You can see our storm just getting going southwest of Hays, Kansas. Another Mesoscale Discussion issued at 3:29 PM CDT, highlighting the environment our storm was moving into and the possibility of 60-80 mph winds as the storm started to bow out into an intense line. Another Mesoscale Discussion is issued at 5:58 PM CDT as the threat of damaging winds continues with the storms forming a bowing line. A new Severe Thunderstorm Watch issued at 7:05 PM CDT ahead of the bowing line forming a severe MCS (mesoscale convective system). This was the third day of chasing as a guide for Silver Lining Tours (http://www.silverliningtours.com/). The day before, we caught 3 brief tornadoes and a beast of a storm in Wyoming and Nebraska. We got ahead of this same system near the South Dakota/Nebraska border area on this day. The thought was storms would form off the cold front/dryline and be rotating supercells with a decent chance to produce a tornado, although temperature/dewpoints spreads were fairly large. A second target existed on the warm front across northeast South Dakota into west-central Minnesota but we thought the storms here would be too messy and congeal too quickly to stray from our closer target. There did end up being a nice tornado in that second target area across west-central Minnesota. We managed to catch a few severe and tornado warned supercells, as well as several gustnadoes on our storms. There were a few tornado reports from the storms we were on, but we could not confirm that these were tornadoes over gustnadoes. First arriving on the supercell with a wall cloud near Bonesteel, South Dakota. Storm had some decent structure at this point. Looking at the northern side of the base and updraft with the core of the storm on the right and wall cloud on the left. Cool shot of the approaching storm and a grain silo in the foreground. Looking west towards the approaching supercell near Pickstown, South Dakota. This is the spot where I shot the time-lapse video above. Gustnado occurring down the road from our location on the bottom right of the image. Storm core coming in from right to left along with the shelf cloud. Another shot of the storm and gustnado that is was producing near Wagner, South Dakota. This was called in as a tornado by multiple sources but appeared to be a gustnado to me due to outflow of the storm and no condensation funnel above. Looking at a tornado warned storm to the west, while the tour group enjoys the spectacle. Rainbow on the backside of a different storm as we were getting close to sunset. A few of the guests caught lightning and this rainbow in their shots. At sunset on the back of the storm, looking southwest. Cool looking sky with good color, mammatus clouds and the shot of an anvil from another storm in the distance. Terrific looking sky at sunset looking west in northeast Nebraska. Mesoscale Discussion issued by SPC at 2:32 PM CDT, highlighting the threat for storms to develop by 21Z with primary threats being wind damage and hail, along with some tornado threat. Tornado Watch issued at 3:15 PM CDT for the area, valid until 10:00 PM CDT. Another Mesoscale Discussion issued at 3:46 PM CDT from eastern Nebraska into southeast South Dakota and northwest Iowa. Additional storms expected to form ahead of the initial storms that we were chasing along the South Dakota/Nebraska border. A Mesoscale Discussion issued at 5:43 PM CDT as intense storms were maturing and new storms started to fire on the warm front and ahead of the low on the triple point. Mesoscale Discussion issued at 8:34 PM CDT for the storms that were congealing and becoming less discrete across the eastern Dakotas into eastern Nebraska and western Minnesota. I was chasing as a guide for Silver Lining Tours (http://www.silverliningtours.com/) for this one. 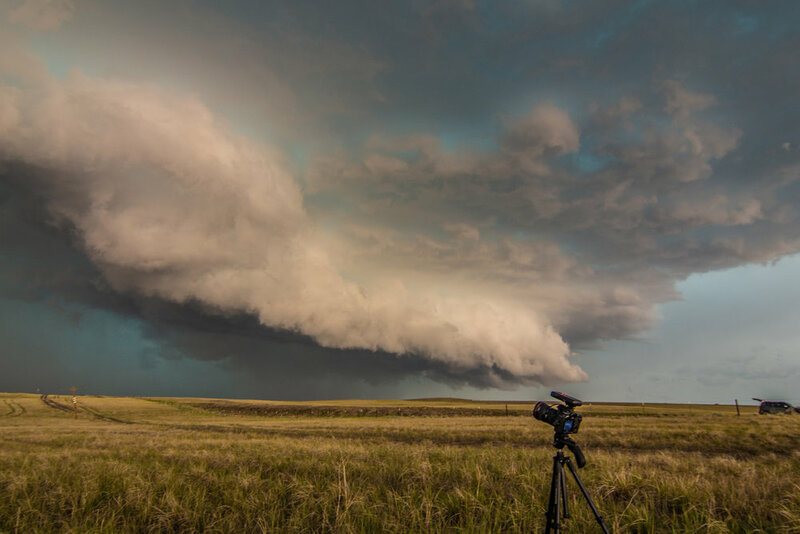 We had high hopes that this would be the best chase of the tour as conditions were ripe for rotating supercells and tornadoes. A trough was ejecting out of the Rockies and into the northern High Plains, with more than sufficient low and deep layer wind shear. Bulk shear as in the area of 65 knots. A nose of 3,000-4,000 J/KG of MLCAPE developed into western Nebraska and eastern Wyoming, allowing for a very unstable airmass. 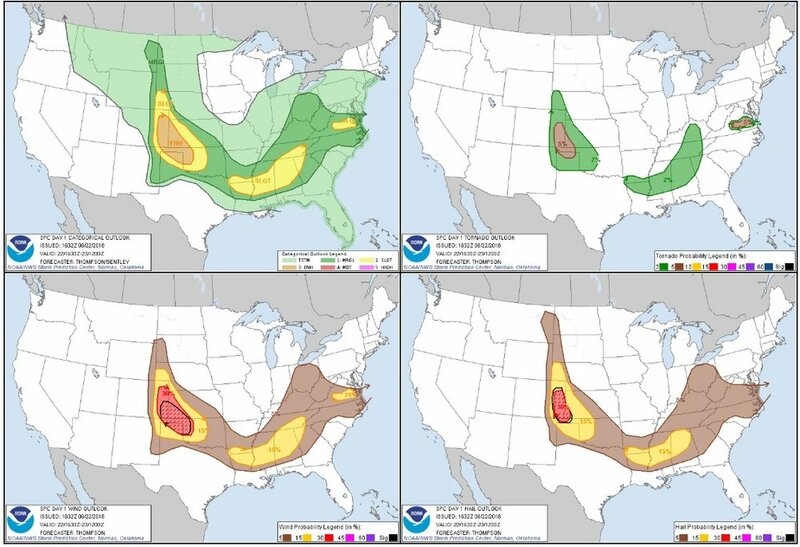 Shear, lift, instability and moisture appeared sufficient for a tornado outbreak to occur. 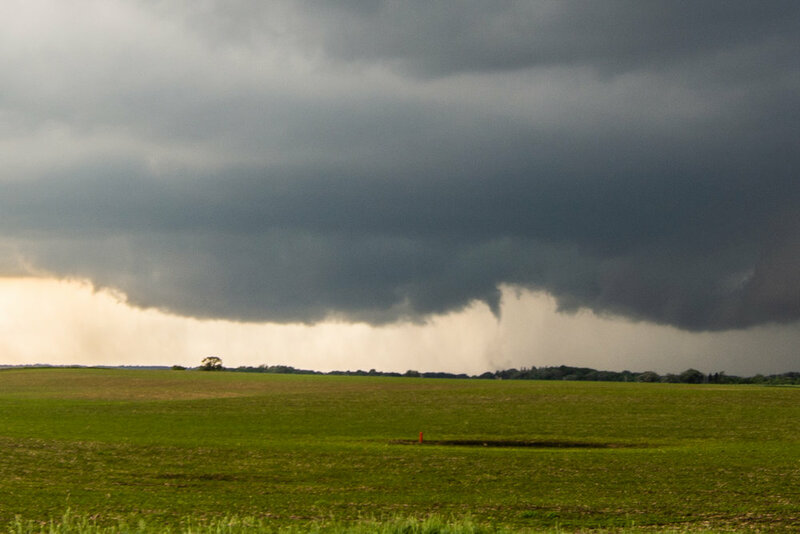 We ended up seeing 3 brief tornadoes on the day, only one shown below and in the video from a distance. I was driving during the other 2 tornadoes. 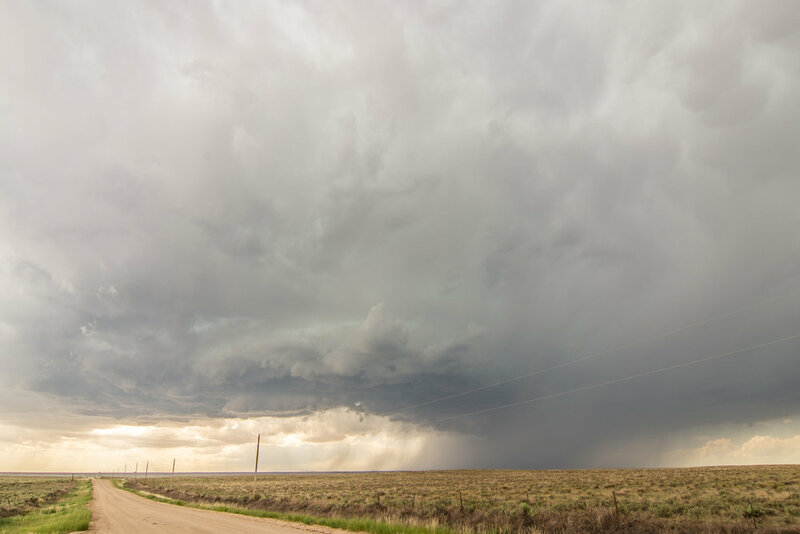 The first supercell that we chased was from near Chugwater, Wyoming to Torrington, Wyoming. The second supercell became large, photogenic and very intense. We chased this storm from near Bayard to Alliance, Nebraska. Storm looking even more amazing as it approached our location. Love those stack of plates! This photo is out of sequence with the others. First storm of the day exploding on the mountains to the west of Chugwater, Wyoming. Wall cloud already developing on the left side of the core. Wall cloud trying to organize to the east of Slater, Wyoming. Moderately fast inflow occurring from right to left into this base. Another wall cloud in the foreground trying to organize. Large, low-hanging rising scud bomb in the distance being pulled into the base and around the wall cloud. This was near Rockeagle, Wyoming. Wall cloud tightening up and spinning near Rockeagle, Wyoming, shortly after the previous image. Had a bad road network here, so only could capture this tornado from a distance as we looked west from near Lingle, Wyoming. Multiple low inflow bands pulling in rich moisture with the second supercell we chased near Bayard, Nebraska. A short time before, this the storm developed two brief tornadoes. I was driving the van at that point and not able to capture a photo. Awesome mothership structure, stacked plates, and shelf cloud on the storm as it became high precipitation (HP) near Angora, Nebraska. Mothership about to engulf a train between Angora and Alliance, Nebraska. Storm spitting out lightning left and right as it was about to overtake us. Had to get out of the way shortly after this as the storm had huge hail within the core. Another shot of the lightning and mothership supercell south of Alliance, Nebraska towards sunset. Plenty of cloud-to-ground lightning to go around! Was popping lightning all over the place and the storm was very intense at this point. Tornado warned with a considerable couplet on radar embedded in the high precipitation monster. Another shot of the lightning at dark. Had to get out of the way shortly after this photo as it was a very dangerous, intense supercell. Mesoscale Discussion issued at 11:29 AM MDT, already talking about issuing a tornado watch as thunderstorms develop over the next few hours. Tornado Watch issued at 1:10 PM MDT, valid until 8:00 PM MDT. New mesoscale discussion issued at 5:05 PM MDT for the area with greatest risk for strong tornadoes and all severe weather hazards. Mesoscale discussion issued at 8:02 PM MDT as dangerous supercell thunderstorms continued to move northeast through Nebraska, western South Dakota and northeast Wyoming. This was the day we had been waiting for and the reason for the whole trip. 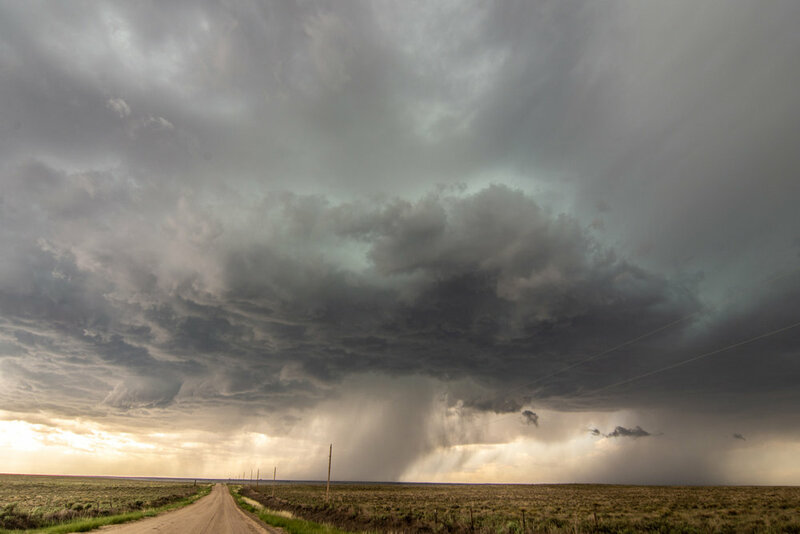 An upper trough was ejecting out into the Plains with strong 55-65 knot winds at 500 mb, amble moisture, instability and strong wind shear to allow for rotating supercells and tornadoes. Wes Hyduke and I left Garden City, Kansas late morning and made our way down to west of McLean, Texas off I-40 to get in position. We encountered 3 separate supercell storms, starting near McLean, Texas and ending near Sentinel, Oklahoma. 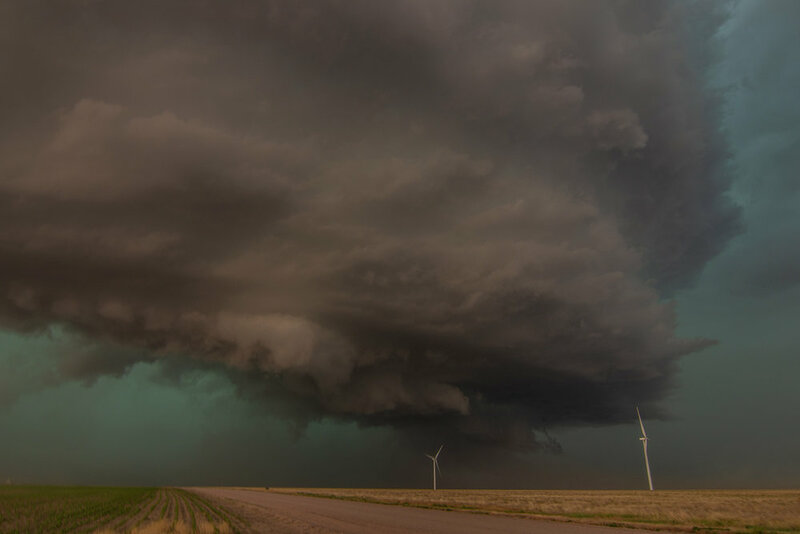 The McLean storm produced a photogenic tornado, while the storm near Sayre, Oklahoma had a tornado debris spin-up underneath the bowl lowering and mesocyclone. This second storm is the one that brought the big rain-wrapped tornado that led to extensive damage in Elk City, Oklahoma. This was followed by a spectacular cloud-to-ground lightning show near Gotebo, Oklahoma. A great chase day! Awesome elephant trunk tornado near McLean, Texas. We stopped next to a Doppler on Wheels truck to view the tornado in the distance as it was churning away. This photo is out of sequence with the others below. Wall cloud on the first tornado warned storm of the day near the Gray County Rest Area, to the west of Alanreed, Texas. Wall cloud on a second tornado warned storm east of Howardwick and south of Alanreed. Taking on terrific structure at this point with inflow tail on the right into the base and condensating wall cloud. This was the storm that produced the tornado near McLean a short while later. WE'VE GOT COWS! Had to evade a herd of cattle on dirt road 20 south of Alanreed and northeast of Clarendon, Texas. Was a funny moment when we were trying to get in position to intercept a tornado warned storm heading towards McLean. Approaching the tornado warned storm southwest of McLean, Texas on highway 273. Wall cloud with large inflow tail right to left into the storm. Radar grab showing our location close to the time the previous photo was taken. TORNADO! Beautiful elephant trunk to rope tornado south of McLean, Texas as we were driving north on highway 273. We drove up highway 273 towards McLean and looked off to the left to see the tornado still going strong! I am still not sure if this was a second tornado or in the roping out stage of the first tornado. Could have rotated around the mesocyclone and back west. Appeared to me to be a 2nd tornado on a new updraft off the dryline well to the west of the first tornado, but cannot be sure. A zoomed in view at the base of the tornado south of McLean, Texas. There was decent rotation at the base of the tornado towards the end of its life cycle but it did not appear to be violent. Tornado in roping out stage towards the end of its life-cycle. Rainbow below and exploding supercell updraft as we approached a new storm northeast of Vinson, Oklahoma. One of the best inflow tails that I have ever seen. 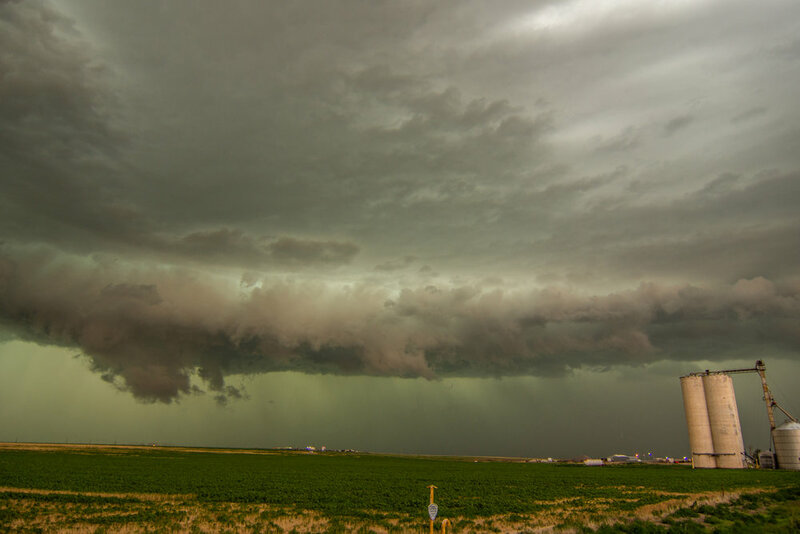 This thing was like a conveyor belt of warm, moist air into the storm base and shooting directly into the updraft. Near Sayre, Oklahoma. Another tornado spinning up dirt directly underneath a fast spinning mesocyclone near Sayre, Oklahoma. A beautiful storm at this point! Thought this was going to drop a big multiple vortex tornado right in front of us, but it never grew beyond this. Awesome storm structure with beaver tail, wall cloud, quickly rotating mesocyclone and dusty tornado underneath near Sayre, Oklahoma. Had to get a photo in front of this storm! It had everything. A short while later as the mesocyclone was approaching. Still a fast rotating wall cloud, somewhat rain-wrapped, and producing funnel after funnel. Meso really getting close at this point. Strong rotation and funnel very close to the ground. May have touched down again here but not for certain. Still southeast of Sayre and west of Carter, Oklahoma. Very close to producing a tornado here. Strongly rotating wall cloud and funnel. This is looking directly into the notch from the northeast side near the forward flank core. Had to get out of here shortly after this photo was taken. The storm later went on to produce a large tornado that hit Elk City, Oklahoma. Ended the day with a terrific cloud to ground lightning show near Gotebo, Oklahoma. UNREAL lightning strike that occurred directly in front of our car and right in the middle of my camera frame! Probably will never get a lightning shot even comparable again in my lifetime. Fortunately, I was in the car and had a remote trigger for my camera, which was outside on a tripod. Camera settings were ISO 100, f/22, and 20 second exposure. Mesoscale discussion issued at 1:19 PM making note of the tornado watch that will be issued shortly. Particularly Dangerous Situation (PDS) tornado watch issues at 1:50 PM until 10:00 PM CDT. 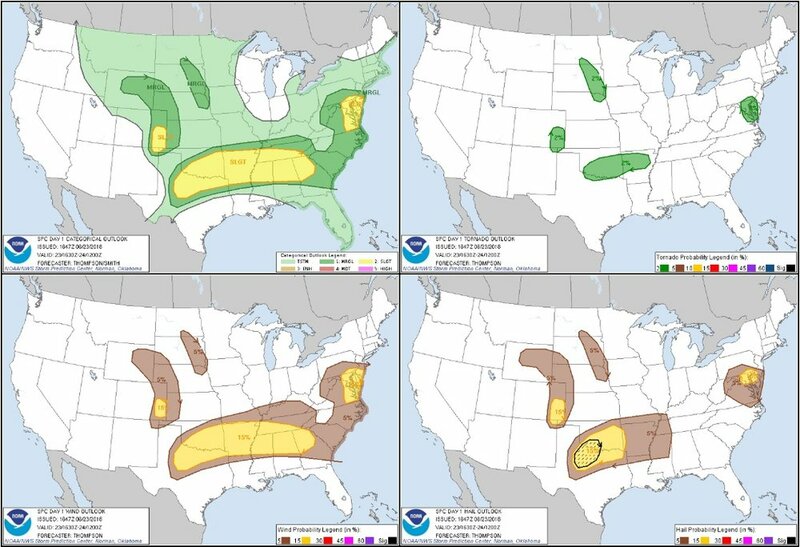 Note the high likelihoods for tornadoes, wind and hail. New mesoscale discussion issued at 4:56 PM, highlighting the small area where tornado risk would be greatest as well as extremely large hail. This area highlighted was where the 2 storms in which we saw tornadoes were located. Another mesoscale discussion issued at 7:29 PM, highlighting a continued tornado risk east of where the current tornado watch was in place. Wes Hyduke and I left Minnesota on this morning and drove to northwest Kansas where we intercepted a couple of photogenic supercell thunderstorms. This chase was primarily by chance as we were on our way to chase in the Texas Panhandle the next day. We decided to take a detour to view the storms in northwest Kansas and glad that we did. Captured a cloud-to-ground lightning strike out of the storm as we watched from the southeast side. This photo is out of sequence with the others below. Terrific mammatus display on the storm as we approached near Hill City, Kansas. Looking directly upwards at the mammatus clouds under the anvil on the storm west of Hill City, Kansas. The storm started to get some decent structure near Hoxie, Kansas. I love chasing in the wide open Plains! Looking at the storm updraft and inflow bands feeding into it near Hoxie, Kansas. Severe thunderstorm at this point. Great structure on the storm at this point but storm starting to congeal and become more of a cluster. A left-moving low precipitation supercell north of Garden City, Kansas at the end of the day. MESOSCALE DISCUSSION ISSUED FOR THE AREA AT 3 P.M. CT. The shelf cloud approaching me, looking west near Jordan, Minnesota. 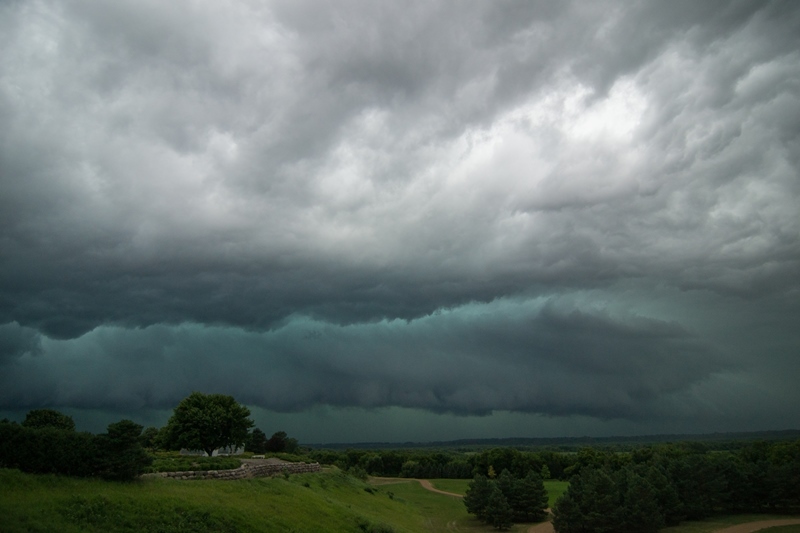 Shelf cloud nearing, overlooking the Minnesota River Valley near Jordan. Northern end of shelf is wrapping back into the core and bowing out just west and southwest of my location here. The shelf looking more ominous as it comes in! Wind has not started to pick up quite yet. Looking northwest towards the southwest metro overlooking the river valley. You can see the northern end of the shelf wrapping back into the core with the possibility of some rotation here. The shelf just about to overtake me with rain just starting. Winds were really starting to kick up here and gust 30 mph as the shelf moved over. Intercepting a tornado warned supercell west of Lake Shore at the intersection of Cty Rd 1 and 88th St. Nicely structured storm with inflow streamers, large base and wall cloud. The lowering/wall cloud was tough to make out until the storm got closer due to being shielded by rain. Looking a bit to the right of the base and updraft at the intense core that went on to produce baseball size hail near Nisswa. A closer view of the wall cloud west of Lake Shore, Minnesota. There was clear rotation at this point and fairly fast condensation into the base. Wall cloud started to become more ragged as it approached my location but still evident tucked in right by the core and underneath the base. Wall cloud forming over North Long Lake to my east. This is where I came across a vehicle that was down in the ditch and backwards, close to the lake. I checked on him and the guy was ok and had already called for help. Wall cloud becoming better organized east of North Long Lake as I watched to the west. Attempted to catch up with the storm right after this but got slowed going through Brainerd. View of the strong and still tornado warned high precipitation (HP) supercell moving north of Mille Lacs Lake. This was taken in Garrison looking northeast. Double rainbow north of Ogilvie, Minnesota. WHOA, A DOUBLE RAINBOW!! Base of the former tornado warned storm, and lightning, near Big Lake, Minnesota at the end of the day.